Heavy duty galvanized steel. For 3/16 cables. Steel ball bearings for smooth operation. Can be used as stationary pulley on door frame or attached to garage door spring. Includes fork, nut and bolt. Strictly for residential installations. Solid nylon wheels offer smooth and quiet operation.. 4? shafts and 1-7/8? diameter wheels, and fit all standard residential 2? tracks. Two roller assembly. 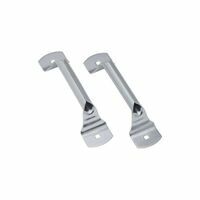 National Hardware Lift Handle, Series: V7638, 7-1/4 in Length, Steel, Galvanized, BHMA A138.18 Used for overhead sectional doors. Steel thickness min. 0.067 max. 0.075. Made of #15 and #14 gauge steel. No. 1 hinges are installed down the center of the door to connect all panels together, and on the outer edges of the door to attach the first (bottom) and second panels. No. 2 hinges are installed on the outer edge of the door, connecting panels two and three. No. 3 hinges connect panels three and four. Packaging includes carriage bolts, nuts, and complete instructions. Used for overhead sectional doors. Steel thickness min. 0.067 max. 0.075. Made of #15 and #14 gauge steel. No. 1 hinges are installed down the center of the door to connect all panels together, and on the outer edges of the door to attach the first (bottom) and second panels. No. 2 hinges are installed on the outer edge of the door, connecting panels two and three. No. 3 hinges connect panels three and four. Packaging includes carriage bolts, nuts, and complete instructions. Used for overhead sectional doors. Steel thickness min. 0.067 max. 0.075. Made of #15 and #14 gauge steel. No. 1 hinges are installed down the center of the door to connect all panels together, and on the outer edges of the door to attach the first (bottom) and second panels. No. 2 hinges are installed on the outer edge of the door, connecting panels two and three. No. 3 hinges connect panels three and four. Packaging includes carriage bolts, nuts, and complete instructions. For overhead sectional garage doors. Used in place of hinge for the garage door rollers. Includes all bolts, nuts and complete installation instructions. Steel thickness min. 0.067 max. 0.075. Steel gauge #15 and #14. Two rollers assembly, each roller contains ten ball bearings for smooth operation. 4? shafts and 1-7/8? diameter wheels, and fit all standard residential 2? tracks. Used on side by side hinge placements for added strength. Factory lubricated, steel inner race with 10 ball bearings. Roller 1-7/8" O.D. National Hardware Door Dead Bolt, Series: V7650, Rim Cylinder Pin, 3-1/8 in Overall Length, Steel, Aluminum, 2 in Length Shaft National Hardware Door Roller, Series: V7602, Heavy Duty, Suitable For Use With: Residential Garage Doors, 1-7/8 in Roller Diameter, 10 Ball Bearing, 4-3/8 in Overall Length, Plain Steel, 7/16 in Shaft Used for installation of SK7112 garage door extension cables and rollers. Both left and right brackets are included along with carriage bolts and nuts for installation. Steel thickness min. 0.067 max. 0.075. Steel gauge #15 and #14.